What are some things that come to mind when you think of spring? I think of singing birds and butterflies. Pretty pastel flowers. Deep, long rainstorms giving every living thing a satisfying drink of water. Rainbows that show up after the rain is done. Ah spring. It’s one of my favorite times of year. 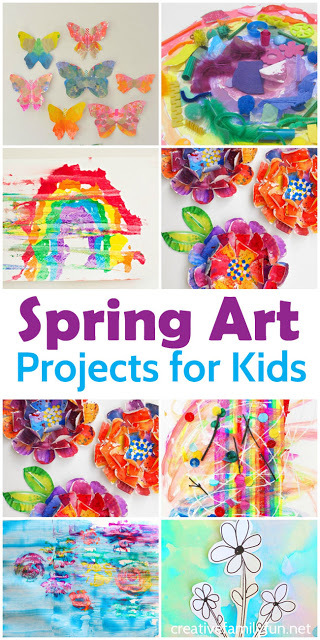 And, it’s the perfect time of year for one of these colorful spring art projects. All of these spring art ideas capture the spirit of spring, the colors, and the new beginnings. They’ll all look beautiful on display and would give your walls a touch of spring. Delight your sense of smell when you create with these Spring Scented Microwave Puffy Paints from Fun At Home With Kids. Create beautiful flowers and other spring scenes with this Pasta Mosaic Art Project at Buggy and Buddy. Grab some bubble wrap to make these beautiful Bubble Wrap Spring Blossom Trees from Arty Crafty Kids. Spring brings thunderstorms and a rainy day would be a great excuse to make some Thunderstorm Art from Buggy and Buddy. Celebrate the rainbow after the storm with some Rainbow Shaving Cream Marbled Art from Hello, Wonderful. Turn scrap craft supplies into a beautiful Rainbow Mandela from Finding the Golden Gleam. Create beautiful rainbow collages with this fun Rainbow Scrape Painting Art Project from Hello, Wonderful. 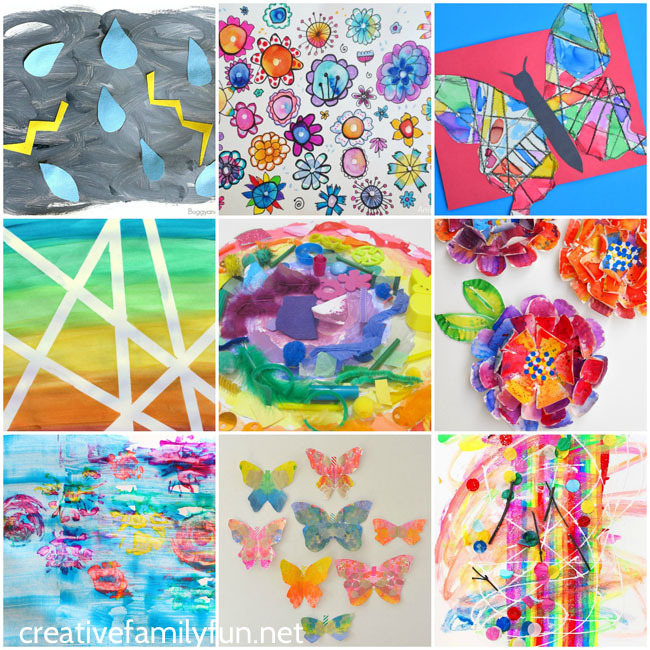 Take advantage of a rainy day and use the rain to help you create some pretty Rainbow Rainy Day Art from Rhythms of Play. Experiment with tape resist to make these Watercolor Rainbow Tape Resist Paintings from Nurture Store. Turn watercolor splotches into a field of spring flowers with this Watercolor Flower Doodles project from Art is Basic. Take flower pictures from magazines and turn them into beautiful Flower Art from Mom on the Move. Use watercolor resist to make these simple Watercolor Flowers from SparklingBuds. Paint with flowers and get some beautiful results with this Flower Print + Scrape Painting Project from Playful Learning. Turn paper plates into huge, gorgeous flowers with this Hyper Colorful Painted Paper Plate Flowers project from Pink Stripey Socks. Paint a pretty flower background to display flower drawings with this Flowers on Watercolor Background at Buggy and Buddy. Play with symmetry to make these pretty Butterfly Symmetry Art with Warm and Cool Colors. Make a whole wall full of these Melted Crayon Butterflies from Art Bar. Use watercolors and crayons to make these gorgeous Stained Glass Butterflies from Rainy Day Mum. 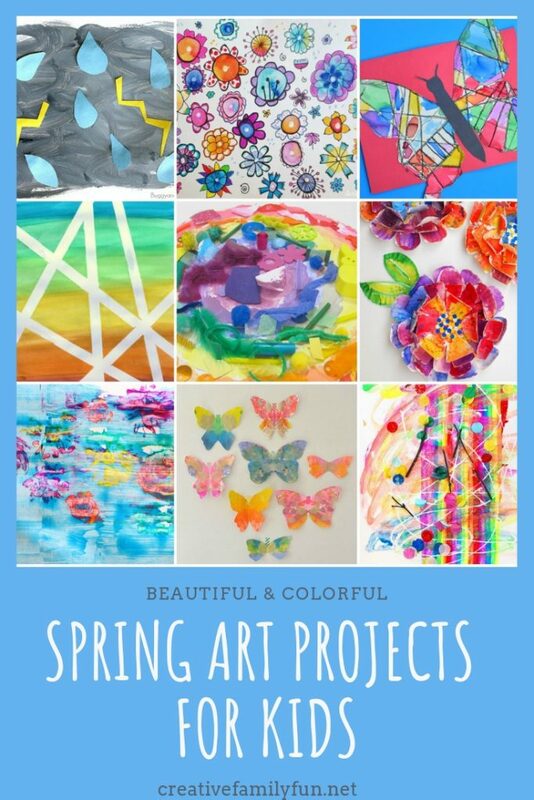 Which one of these beautiful spring art projects do you want to try?